My insider knowledge tells me that this is how all cat ladies wake up in the morning, with their felines on their head. I had no idea iguanas behave the same way. 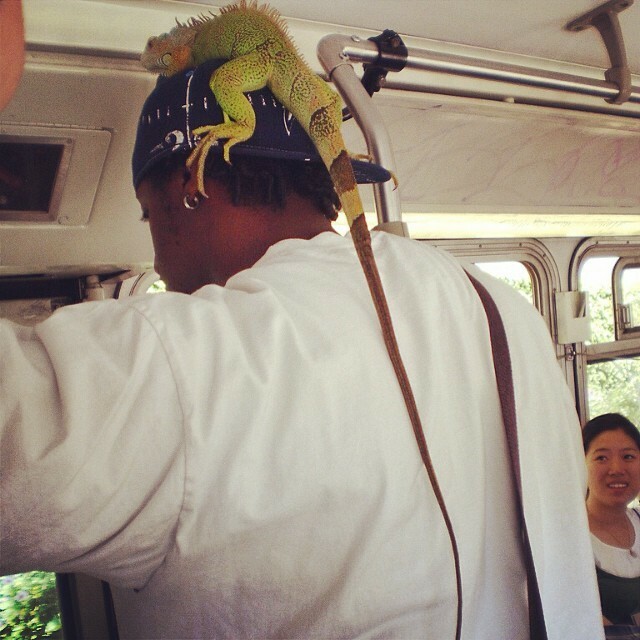 This iguana hitched a ride all the way from its house onto Muni, and both the iguana and his owner seemed extremely relaxed about it. I can’t be sure that this is Charlie, or Charlie’s cousin, who is not to be confused with Skippy, the iguana of Wall Street Journal fame. But his athleticism is none the less impressive. More of the Muni zoo this way, everybody.